The traditional way of installing serial devices is to connect them to directly to PCs via serial cables or a modem. This restrictive method demands the use of dedicated PCs and limits the distance of communication to the length of physical cable. With the AXIS 2490 Serial Server, it's now possible to connect serial devices directly to a network without using a PC and empowering applications with convenient remote access to serial resources over HTTP and TCP/IP. A PC application uses a network socket or COM Port Redirector to communicate with the AXIS 2490 and connecting serial devices. A PC connects to the network-connected AXIS 2490. This method is suitable for old applications that use the serial port but are not able to use a COM Port Redirector. Two AXIS 2490s connect to each other in back-to-back configuration to provide a virtual extension cable. With its own built-in Web server, the AXIS 2490 allows direct access from any browser on the network to provide full Web-based control of the management and configuration functions. It enables 10 Mbps and 100 Mbps Ethernet network access to serial devices using TCP/IP or HTTP as the transport protocol. It supports high data rates and high data throughput. The AXIS 2490 replaces one or two serial servers, long clumsy cables and a PC, to make for a tidy, convenient, installation that is seriously cost-effective compared to any traditional RS232 solution. Contact any serial application or device remotely. Once connected to the network, there are no physical constraints to the distance over which a serial device can communicate (other than those imposed by your security firewall). This means that serial devices can now be managed and controlled centrally from anywhere on the network - that's extremely useful if many people need access to the same device. Service engineers, especially, will find the AXIS 2490 an invaluable tool for troubleshooting computer devices remotely: extending system uptime, and eliminating the need for moving parts, i.e. the hard drives in the PC's. Completely independent of any other server the AXIS 2490 requires no special hardware or software. All you need is Netscape Navigator 4.x or above, or Microsoft Internet Explorer 4.x or above. The AXIS 2490 has complete plug-and-use functionality - all you need do is assign a valid IP address. The AXIS 2490 connects directly to Ethernet or Fast Ethernet networks. Its Web-based interface greatly simplifies the installation process to allow seamless integration into your networking and application environments. Supporting TCP/IP, HTTP and other protocols, the AXIS 2490 can be used in mixed environments, such as Windows, UNIX, Macintosh and OS/2. It will also integrate easily into WWW/Intranet applications and CGI scripts. Configuration and management the product using the built-in Web-based Administration Tools. Adjust the settings for the serial ports, system security, and the network, directly from your Web browser. Data protection is normally implemented by your Network Administrator via the security settings in combination with an organization's Internet firewall. The Administrator decides whether individuals, groups, the whole company or the whole world may access your Serial Server. The AXIS 2490 supports multi-user password protection, with user and IP-address filtering of the serial ports in TCP/IP mode. 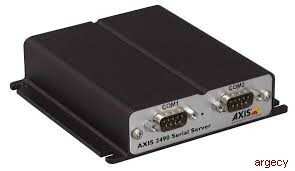 Driven by the powerful AXIS ETRAX 32-bit RISC processor, the AXIS 2490 incorporates Axis' renowned chipset technology that is founded on an open system architecture and streamlined to provide device connectivity independent of any file server. Including a Boa Web server, the Linux operating system provides a stable platform for open-source development in future releases of the product. In accordance with the GNU General Public License, Axis have published the kernel for this product at http://developer.axis.com/.